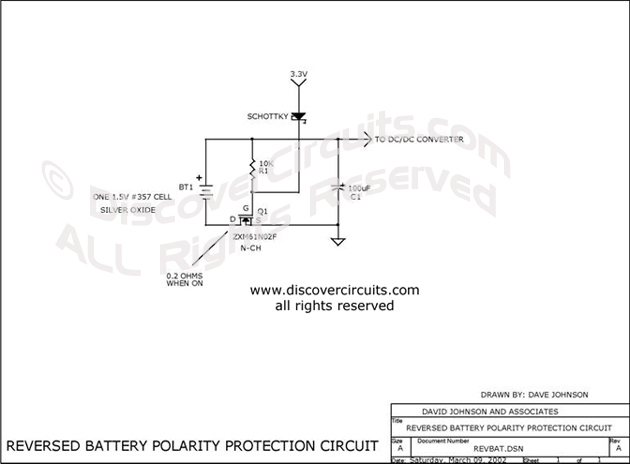 Circuit: PROTECTS FROM BATTERY POLARITY REVERSAL__ Circuits designed by David A. Johnson, P.E. This simple circuit can protect a sensitive electronic circuit from an accidental connection of a battery with a reversed polarity. The N-channel FET connects the electronic device to the battery only when the polarity is correct. The circuit shown was designed for a device powered from a single 1.5 volts button cell battery. However, the circuit will operate with higher voltages as well.